Collier Estates: Perfect Starter Home In Collier Estates, Private Fence surrounding home, Large Kitchen and Family Room! Three Bedrooms with wood floors! Lots of yard space, both in front and back of house! Huge Front Porch Perfect for entertaining! Shed for extra storage, 3 miles to the Beach, Easy Access to I-95 Highways, close to Restaurants, shopping plaza, and schools. NO HOA!!!! OVER $70,000 IN EQUITY!!! 3 Beds / 2 Bath CBS House. Solid structure, lot corner lot, nice 5 years old shingle roof. No fees due to the buyer. Property needs light rehab, no more than $8,000. Cash or hard money investors. Ideal fix and Flip property, much potential. Comps up to $300k! Rental average over $2,000 a month. Handyman. Fixer. 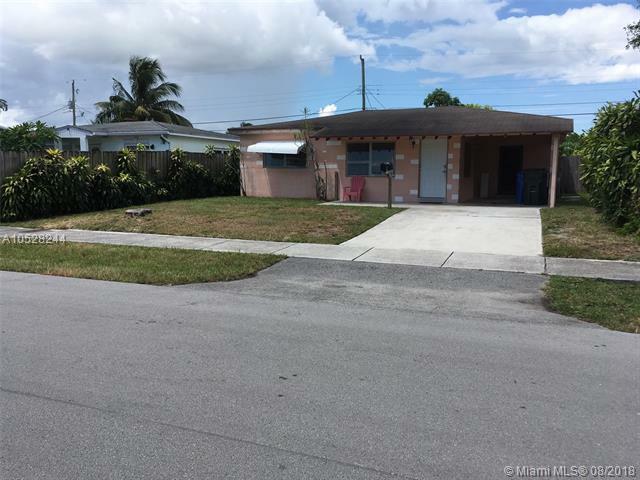 Tamarac Hills: Opportunity awaits in the 5 bedroom 2 bathroom home (2 additional bedrooms may not be legal). Covered patio. tile throughout, fenced in backyard, kitchen has bar. Mold discoloration present and may require some roof repair. North Andrews Gardens: Don't Miss This Adorable 2BR/1BA North Andrews Gardens Beauty. Brand New Stainless Appliances with Granite Counters and Oak Cabinets in Kitchen. Light Pours Into This Home Through All Impact Windows. Freshly Painted Inside and Out. All Tile Flooring. Updated Bathroom. Light Bathed Florida Room. French Doors in Master Bedroom Lead To Paver Patio and Huge Private Backyard with Room for Pool. Large Paver Driveway and Carport. Auto Sprinkler System. Washer & Dryer in Large Inside Laundry Room. Attached Storage Shed too. You Won't Find a Nicer at Home at This Price. North Andrews Terrace: Clean and Bright Single Family Home. This home features new electrical panel, new refrigerator, new A/C, new water heater, all impact windows. In ground automatic generator, family room and much more. Close to the beach, shopping restaurants and more. This is a MUST SEE. Twin Lakes Homes: Nice 3 bedrooms / 2 bathrooms single family home. Features covered entrance, carport, large windows throughout, spacious bedrooms with plenty of closet space. Backyard completed with a covered patio. Kitchen equipped with updated appliances, plenty of cabinetry and counter-top space. Easy to show and priced to sell. North Andrews Terrace: INVESTORS ONLY! HOME HAS BEEN LEASE 1/1/19 ANNUAL AT $1850/MO! Great Income producing property!All Tile! Home Bigger than tax roll! Approx 1700 sq ft. Can be 4 bed or 3 bed plus in law suite. Master bedrm has HUGE walk in closet. New A/C! Roof approx 7 yrs. Home has big addition which can be sectioned off. Plenty of Room to Expand. 3 bed 2 bath formal dining or living/family. French doors to enclosed patio with wall a/c and walk in closet. So much space! large fenced yard very tropical setting. Great outdoor space in this sought after neighborhood. No Hoa. Don't miss this! North Andrews Terrace: GREAT INVESTMENT to live in or rent out and keep! Fall in love with this COZY 2/1 located on a quiet dead end street in the desirable community of North Andrews! **New roof, electrical panel and freshly painted** Features crown molding, granite counters and new landscaping** HUGE backyard perfect for tropical oasis & large pool** AirBnB and/or VRBO Opportunity for Investors** Carport converted into storage room, has separate entrance, could be used as 3rd bed/office/den- and/or rental income** NO HOA, Dog friendly neighborhood** Located minutes from I-95, Airport, Beaches and Downtown! Call Listing Agent for a Private Showing! North Andrews Terrace: RECENTLY REMODELED 3 BEDROOMS 2 BATHROOMS HOME. ROOF IS APPROX. 5 YEARS OLD. BACKYARD IS FULLY FENCED WITH GATES ON EACH SIDE. NEAR LAUDERDALE BY THE SEA,BEACHES, RESTAURANTS, MAJOR SUPERMARKETS AND HOSPITALS, I-95 ON THE NORTH SIDE OF COMMERICAL BLVD AND 14 MINUTES NORTH FROM FT LAUDERDALE INTERNATIONAL AIRPORT AND 10 MINUTES EAST FROM FT LAUDERDALE EXECUTIVE AIRPORT. Tamarac Hills: Gorgeous Home in Whispering Lakes Oakland Park, No HOA, Quiet neighborhood, Over size corner lot. Two Bedroom, 1 Bath With tons of Room to convert to a 3 bedroom 2 bathroom easily Bringing value of house to mid $300's, Great flooring, beautiful bath, and stunning kitchen with surround counter top for Chefs who like to entertain as they cook. Rustic barn doors give this home a true cozy feeling. Impact Windows and Shutters give an added sense of Security and Protection from South Florida's harsh Hurricane Season. Just bring Bed and favorite blanket to this Turnkey Property. This property is ideal for Empty Nesters, Retirees, and Newly Weds! Seller is Motivated. North Andrews Terrace: Fantastic find in Andrews Gardens. This yard and this house is unlike anything on the market-promise you will not be disappointed. Wood cabinets, Fenced yard and tons of room for a pool. Hurry before it goes. Twin Lakes Homes: Move-in-ready 3 bed 2 bath home, clean and bright with brand new roof, new electric, new flooring, upgraded kitchen, windows in back room will be replaced first week February. Nice Oakland Park neighborhood, close to 95, shops, schools & restaurants. Rooms have brand new carpets, plenty of closet space, driveway & covered carport. Fenced backyard for privacy, room to add pool or outdoor living space, new turf. Easy to show. Collier Estates: Beautiful corner lot house located in Oakland Park 4 beds 2 baths plus a den. Huge master bedroom with its own full restroom. Very spacious home for a big family. Close to beaches, nice shopping centers and just 10 minutes away from airport. Really nice neighborhood, the house is ready to move in. All additions on the house have been fully legalized. PANORAMIC BREATHTAKING VIEWS OF THE LAKE FROM THIS UPGRADED SINGLE FAMILY HOME IN DESIRABLE LOCATION WITHIN OAKLAND PARK. ONE BEDROOM ON THE FIRST FLOOR, NEWER KITCHEN CABINETS, STAINLESS STEEL APPLIANCES, TILE IN THE MAIN LIVING AREAS, WOOD FLOORS IN BEDROOMS, LARGE TERRACE OVERLOOKING THE WATER, UPGRADED BATHROOMS WITH NEW VANITIES AND MORE. FULL SIZE WASHER AND DRYER, QUITE COMMUNITY, ALL AGES AND PETS WELCOME. North Andrews Gardens: Owner motivated to sell, price dropped 10k! This home sits on a corner lot facing a small but lovely and quiet park. The living room is spacious and it has an updated open kitchen. One bedroom has a private entrance, great for a roommate or rental! Fenced yard. This is one of the best layouts in this area, the bedrooms tend to be larger for the neighborhood. Its a true ranch style, also ideal for a family. The location provides very easy access to I-95 and Florida Tri Rail. Tamarac Hills: Better than new! Gorgeous remodeled home, ready to move in to! New kitchen, new bathroom, new floors, new paint, new roof, even the original cast iron plumbing has been replaced with PVC! Kitchen features quartz counter-tops, brand new S/S appliances, and a floating island! All windows and doors upgraded to hurricane impact glass. New landscaping and sod! Located in desirable Whispering Lakes subdivision within walking distance of Royal Palm Park. Easy to show. Hurry this one won't last long! Large laundry room could be modified to be both half bath and laundry.